Up early, we headed to La Herradura – less than an hour away from Órgiva on the Costa Tropical. It has a marina which was recommended as a spot to have lunch. We could look at boats and pretend we were rich. But we never made it. La Herradura is a pleasant place helped largely by the absence of high-rise buildings and crappy tourist joints. The curving beach (herradura = horseshoe) has a few decent-looking restaurants on it and, even in mid-October, the place had a gentle buzz about it. There’s a cute covered market which is open all year Monday to Saturday 8am to 3pm. S wanted to ask if there was a road to the marina over the headland but M wasn’t hanging around. We walked east out of town towards the headland and what we hoped would be the marina behind – a lovely twisting coastal road with magnificent villas that reminded us of the Cote d’Azur with its shimmering, turquoise water. A few sunbathers had their own hidden cove. When the marina didn’t appear we headed back and got the car – a fruitless exercise which lead us into a hotel forecourt and eventually onto the main road to Granada. There was a small dispute about whether or not stopping for directions might not have been such a bad idea, but let’s not go there. All was not lost. Salobreña was on the way home so we stopped there for a seafood lunch at El Peñon. 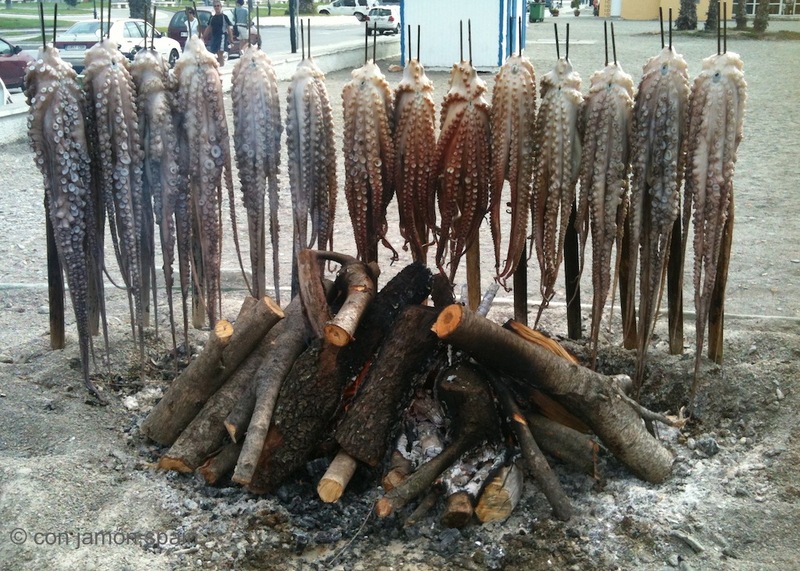 A barbeque-in-a-boat had an impressive cargo of octopuses. 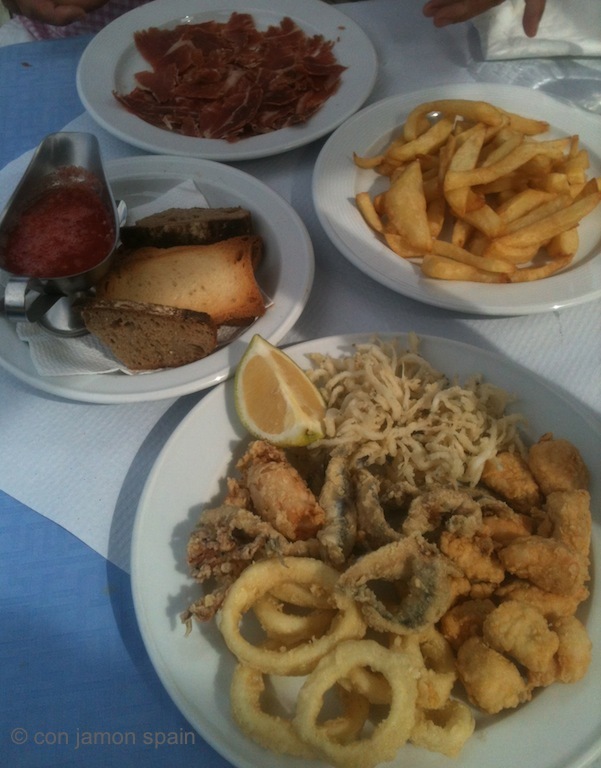 We had a starter of them – smoky and succulent – and then a plate of fried seafood and Alpujarran jamón. Eating octopus reminded M of being on holiday as a boy in Spain and seeing fisherman arrive at the quayside and slam their catch onto the concrete to kill it. Odd how certain memories stay with you. 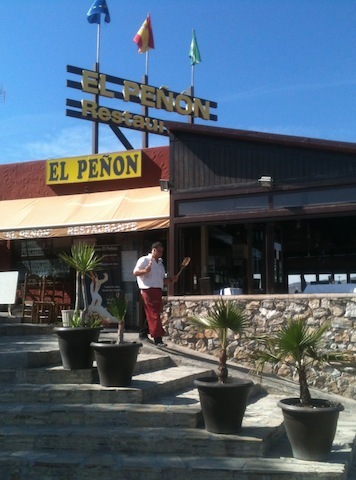 At El Peñon (‘since 1954’), customers were serenaded by, firstly, the theme tune from Star Wars and then two hours of 50s American crooners. But Stormy Weather it wasn’t, just warm sunshine and people jumping off rocks to accompany the meal. For a moment we imagined what it may have been like in the 1950s; dressed-up, smoking Winston cigarettes, driving a big car along the front and drinking Martinis (not at the same time, maybe). And the air, full of peach blossom and bitter almond. But, today, it was an agua con gas instead and clothes looking a bit worse for wear. The afternoon ended with a walk along the beach and an ice cream. Just like the old days – only without the cephalopod mollusc-related violence. 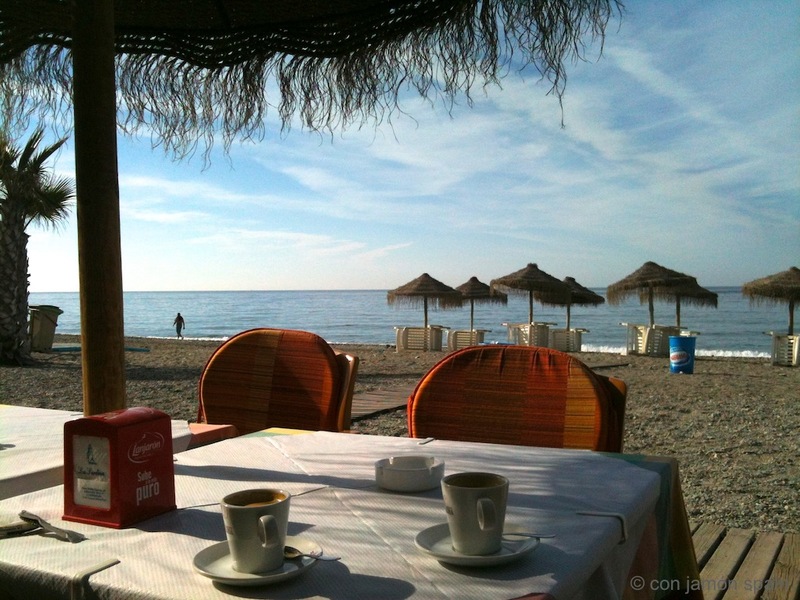 More about La Herradura: It’s a one-hour drive from Málaga, after Nerja and a good place to go scuba-diving. The A-340 skirts along its northern edge and onto Almuñécar and Salobreña (also recommended). Google map. On 19 October 1562 a fleet of 28 Spanish galleons were caught in a storm and tried to take shelter in the bay. Twenty-five ships sank and 5,000 men lost their lives. They’d made their way from Italy to Málaga to clear the coast of pirates and travel to North Africa to protect Spain from the Turkish empire. The remains of the ships have never been found. Thanks for the tip Marianne, we’ll pay closer attention next time we’re there. And La Barca it is. Can you remember how you get there by car? Do you need to park away from the marina and walk or is there a turning we simply missed?